Getting back to my Texas Roots! Although I haven't posted about my Texas Ancestors in awhile, I assure you there has been some major siftin', searchin' and speculatin' goin' on here on CollectInTexas Gal's Tracks of My Texas Ancestors. Meet my Second Great Grand Aunt Palmyra J. Akin Thedford. This photo of her was in my Great Grandmother Martha Jane Marley Carroll's Photo Album, and even though her name was clearly written on the back, I somehow couldn't bring myself to admit that anyone could be named Palmyra. 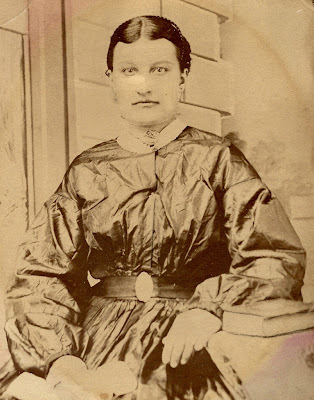 Honestly, I really wanted this photo to be of my Great Great Grandmother Mary Josephine Leatherwood Marley, as I didn't have and couldn't find a photo of her anywhere. You would think Martha Jane would have at least one picture of her own Mother. Finally, I resigned myself to the fact that it was not Josephine, and put it in the back of the 'Old Photo Album'. However, the name really stuck in my head and I decided to give it a Google! 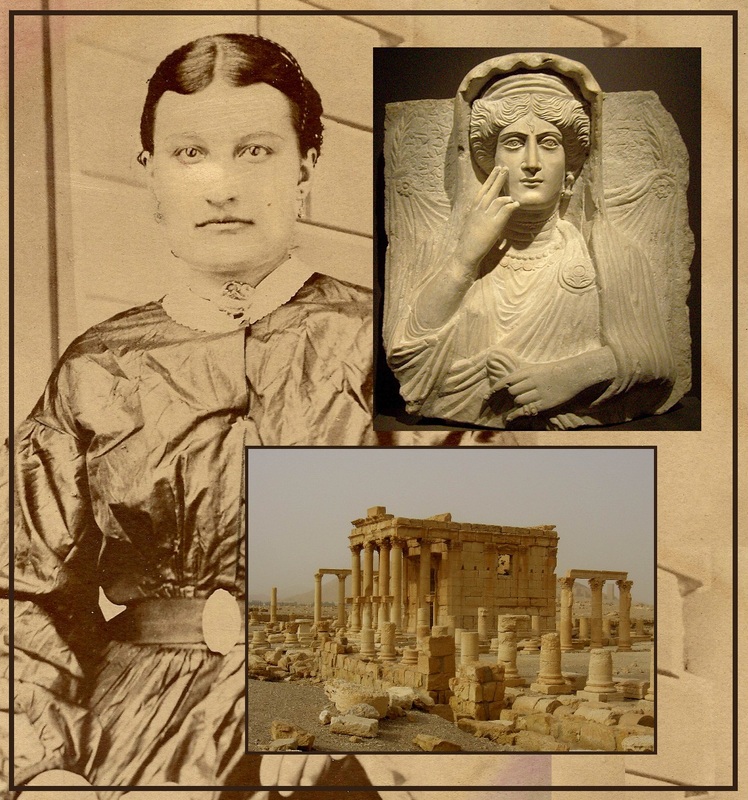 Did you know that Palmyra was an ancient city in Syria? In the age of antiquity, it was an important city of central Syria located in an oasis northeast of Damascus and southwest of the Euphrates. It had been a vital caravan city for travellers crossing the Syrian desert and was known as the 'Bride of the Desert. and end up as one of my Texas Ancestors? 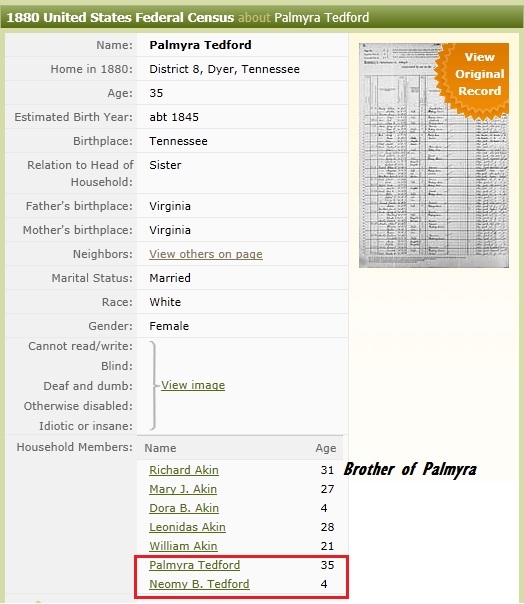 I have NO CLUE why her parents, Stephen B. and Katharine Ann Akin Carroll, gave her the name Palmyra. pictured here with his wife Martha Jane Marley Carroll and their children in 1900. Born Palmyra J. Akin on November 7, 1845. Sluethin'Sue that's my Detective Trackin' name, and as I was Trackin' Stephen's timeline, in the 1880 Census, I noticed a Richard Akin on the original document. 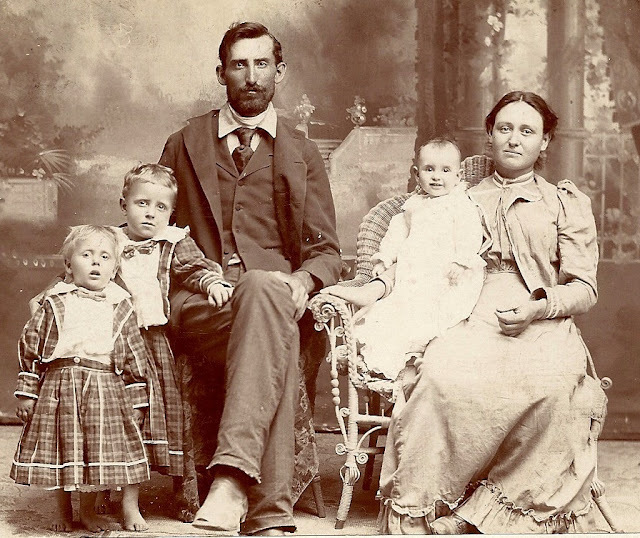 Richard and family lived on the farm next to Stephen's parents and had his mothers maiden name...Akin. You must remember that the Census Takers knocked on every door and hand wrote with a quill pen, and spoke with whoever answered the door. Therefore, spelling and handwriting errors are common on the original documents, and the reason that the Census Forms have been digitized and corrected with the Original Census shown. I always look at the original...they are an amazing piece of history. Speaking of History, I should wrap this up so it can become part of CollectInTexas Gals' Tracks of My Texas Ancestors History. So happy you found out what Palmyra means, that is awesome! I love to read all about my ancestors, it's truly amazing the things you do find out! What a meaningful and awesome post, thanks for sharing. Oh, Sue, how we can get caught up in this history/genealogy! Worse tho is the illiteracy that plagued us with those handwritten records. Those folks would just write by sound & many were so often hard of hearing. On my surname alone we found over 20 varieties of our name. The mystery & search won't let go of you ... it beckons day & night. It is such fun reading your 'finds' & seeing your fabulous photos. I know you certainly must treasure yours as do I, mine. TY for your sweet comments & staying with me on my blog. I will be out of commission a wee bit, until after the eye surgery. Really hard to read right now. What a wonderful mystery a family tree is! You're sure having fun with yours, and you're lucky to have all of those photographs - we have few. I really enjoy these posts - the Historian in me, I guess. Loved this post and the information re. the old names. We have a Palmyra in central VA; it's a wide place in the road but I've always loved the name. Tuesday Tip ~ That's A Fact, Jack!